Kristyna and Mike are a young, fun loving couple who have a passion for travel, people and adventure. Their love for meeting new people and exploring new places has now brought them to the Caribbean. Mike always had a love for water sports. While studying in Cape Town his interest in sailboats evolved. 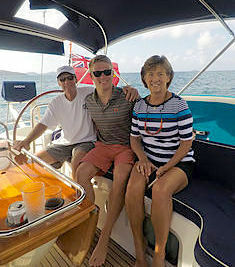 After finishing his degree, Mike began his yachting career as Deckhand on a 45 day passage from Cape Town to St Maarten. This experience had him hooked and he proceeded to work on different boats around the world. After obtaining his RYA Yachtmaster Offshore (for both motor and sail boats), he skippered 2 boats simultaneously in the Med. Sailing boats and the adventures that ensue is what drives Mike's passion for the ocean. He holds RYA Yachtmaster Ocean and AEC Engineering Certification. 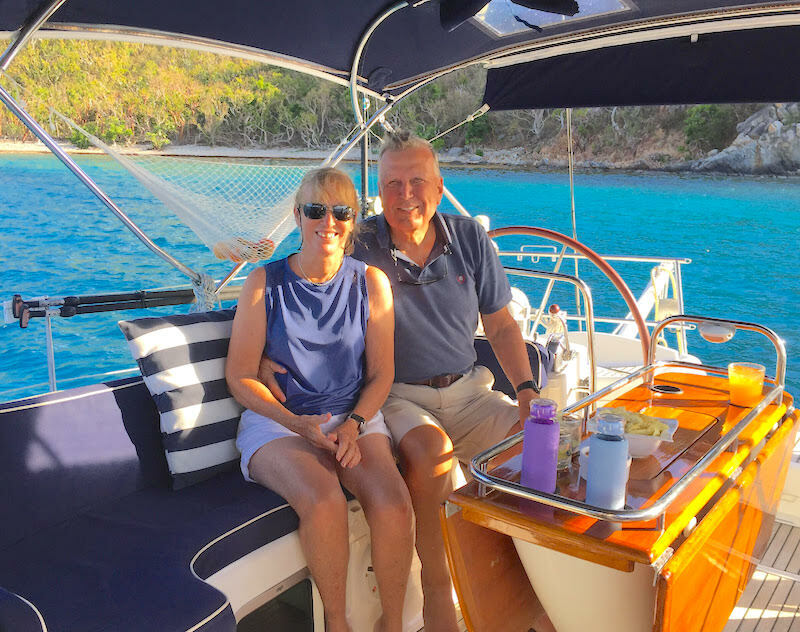 Whether you're interested in sailing, diving, snorkelling, fishing, hiking, discovering uninhabited islands, or just simply relaxing in one of the most scenic tropical destinations in the world, Mike and Kristyna will tailor an experience to your desires. Jemma and Mike look forward to having you aboard Sayang and showing you the best that the Caribbean has to offer. Kristyna grew up on the move traveling with her parents and living in Thailand and the Canary Islands on their sailing boat. Later she came back to her homeland, the Czech Republic, where she studied and after graduating, she decided to continue traveling and left for Colombia and later to Panama, where she started working on various charter boats and yachts as a chef and stew. Before joining Sayang, she was a crew member on a sailing boat, travelling from Panama to French Polynesia. “Travelling is about knowing and exploring local culture and local cuisine”, says Kristyna. She likes to try and combine local recipes she has come across, while adding her own ideas and techniques she has learnt. She enjoys preparing meals from local fresh produce, especially seafood and fish. SAYANG can accommodate 6 guests in 3 cabins. The Master cabin has a queen size bed, shower and toilet. 2 Guest cabins have a queen size bed, shower and toilet. Alternatively, Sayang's two forward qeen cabins may be merged to form one large Master King Suite. Likewise, the aft guest suite may be converted to two twin berths. SAYANG is fully air conditioned through out. Crew has a separate heads and shower. Your choice of fruit salad, toast, pancakes, granola with yogurt or milk, oats, omelets, scrambled, sunny side up or boiled eggs, French toast, selection of pastries. Fruit juice, French pressed coffee and teas. - Peruvian fish ceviche served with patacones (plantain chips) fresh salsa and guacamole. - Fresh tossed salad served with a balsamic reduction glazed chicken, avocado and homemade bread. - Mariners Mussels in a creamy coconut and parmesan sauce. - Classic Spanish tortilla with a light side salad. - Couscous with feta cheese, spinach and asparagus wrapped in bacon. - Creamy pumpkin soup served with fresh homemade bread. - Goulash served with Jasmin rice and fresh salad. - Pan seared ribeye steak drizzled with a fresh mushroom sauce, crispy potato and coleslaw. - Brazilian Moqueca – Fresh fish cooked in a coconut curried sauce with veg and basmati rice. - Rack of lamb served with sauté vegetables, mashed potato and mint sauce. - DIY Fish/Chicken tacos - to die for!!! - Crispy fish balls served with rice and sauté vegetables accompanied by a truffle mayo. - Sesame crusted tuna steak with a creamy lemon sauce. Sayang has a fully stocked bar, please don't be shy to send us your special requests or favored brands so we can make sure to stock them. Thank you very much for making our first trip to the BVI so memorable. We loved every minute of everyday. The sailing was wonderful! Snuba diving was excellent and I doubt we would ever thought of it, if you had not suggested it. The food was outstanding! Kristyna you are an excellent chef and Mike is a great 1st mate in the kitchen! On the other side of this coin is Mike - great captain and Kristyna great1st mate on the boat! We enjoyed relaxing at Oil Nut Bay - a good midweek break. Sayang is a beautifully maintained boat and your pride in her shines through. We are so glad we booked with you and will forever stick with monohull adventures. We are looking forward to sailing with you again in the future. 2018 Christmas Week guests aboard the Jeanneau 54 sloop SAYANG wrote:• Was the crew friendly and accommodating? The crew was very friendly. Mike and Kristýna were lovely and warm. They went out of their way to make us feel welcome and cared for. • Was the yacht comfortable and clean? The boat was beautiful inside and out. The accommodations were comfortable and clean. • Was the food good and well presented? The food was delicious and HEALTHY! Cheers to Kristýna for making exotic and healthy meals in that little galley. Fresh baked bread. Turkey dinner for Christmas and sashimi from fish we caught! • Did you like the area you sailed? Beautiful from Tortola to Anegada to Jost Van Dyke and points in between 116 nm covering in 7 days! Mike and Jemma are superb hosts. The food was excellent. Rene is an excellent cook and she raves about these meals. Mike always reviewed our sailing plans. We always deferred to his suggestions and the results were ideal sailing conditions and welcoming harbors. There is just an atmosphere of friendly accommodation that makes you feel lucky to have chosen to make this trip with them. If you want sailing with professionals, gourmet food, and genuine warm hospitality, choose this couple and their beautiful sailboat, Sayang. Paradise is just around the corner and Mike and Jemma are your perfect hosts. Mike and Jemma, thank you for teaching me the ropes of sailing, letting me take the helm, pick up some mooring balls, and giving me an unforgettable spring break. I now hope to continue both my sailing career and wakeboarding career throughout life.. I sincerely hope we run into each other on the water in the future. Thanks again! PS- If you ever need a deckhand please don't hesitate to call. We had an amazing journey! Onboard with 1 year old and 3 year old in tow. We had wonderful meals, amazing sunsets, incredible dives (turtles, and yellowtail and sharks, oh my!) Smooth sailing, laughs and memories to last a lifetime! Thanks Jemma and Mike. We will never forget these last 7 days. We will be back for those fishes (since we had unsuccessful fishing attempts)! Keep sharing these amazing experiences with people from all over the world. Please contact us if you come by NYC! Couldn't be more perfect. Meals were so amazing. We loved that they catered to our every need and yet allowed us romantic times alone. Very professional, attentive, caring and fun. We would strongly recommend them to our best friends. An adorable couple. What an experience! Union Island in the Grenadines to Antiqua, via the Tobago Cays, Bequia and Montserrat. Beautiful sailing, snorkeling, fishing and quality time together! You guys are the perfect hosts, and I am very comfortable that you are in full control of your wonderful vessel - Sayang! She is an absolute beauty! Thank you for making me feel so at home, and part of the crew. Happy sailing till we meet again!!! Sailing with Mike and Jemma on Sayang was wonderful. The boat sails beautifully, the meals were delicious (thank you Jemma! ), and Mike was an amazing guide to the life underwater - the best snorkeling experience we have ever had. We can't wait to sail on Sayang again. 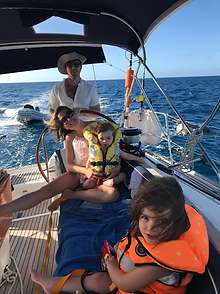 Thanks so much Jemma and Mike we had the best time sailing your baby with you. The knowledge of the Islands and food was AMAZING!! !